THEME: Fluorescence correlation spectroscopy (FCS) is a technique that reveals information about the size and concentration of fluorescent molecules in solution, parameters that can be important in chemistry, biochemistry, and biophysical research. To achieve this, fluorescence is collected from a tiny volume within a dilute solution of fluorophores. Because of thermal motion of the molecules, the measured intensity fluctuates due to the changing number of particles in this volume. Analyzing time traces of these fluctuations yields information about physical parameters of the fluorophores. Typically, such setups involve commercial fluorescence microscopes with expensive optics. For example, a high numerical aperture (NA) objective is required to make a volume of fluorescence excitation that is sufficiently small to conduct such measurements. However, an economical instrument capable of FCS can be built using a low NA objective if the light is further focused through the use of microscopic glass beads attached to a glass surface. These beads behave as lenses that generate “photonic nanojets,” focused beams of light capable of generating an extremely small volume of fluorescence excitation. The cost of the setup can be further reduced by building a relatively simple microscope capable of epifluorescence, rather than utilizing a commercial system. It is worth noting that on its own, this custom-built microscope can also be valuable for teaching about basic concepts related to fluorescence and white-light microscopy. 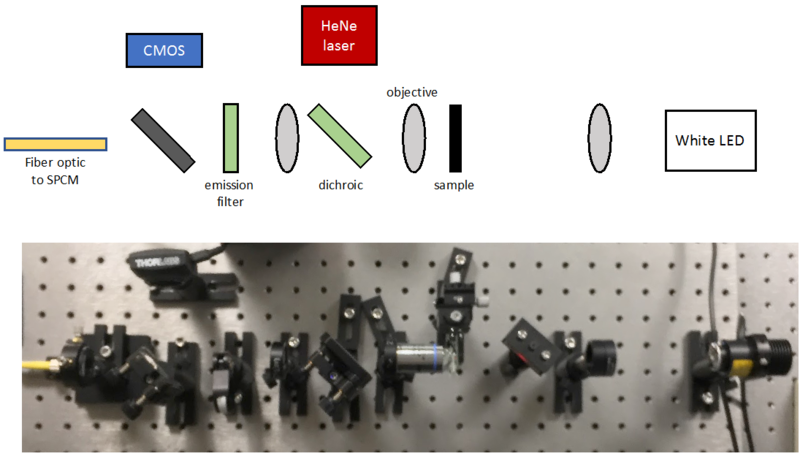 APPARATUS AND COSTS: The apparatus consists of a custom-built microscope setup containing an LED for white light illumination and a helium neon (HeNe) laser for fluorescence excitation. Other necessary pieces of equipment include lenses, filters, and a dichroic as well as a variety of optics mounts and translation stages. Two detectors are incorporated into the microscope: a CMOS camera and a fiber-coupled single photon counting module (SPCM). The apparatus itself costs around $6700. In addition, an optics table is required (for example, a passive support frame plus breadboard can be purchased for about $2500), as well as a PC with Labview interface. Consumable reagents (such as microspheres, fluorescent molecules, microscope slides, and coverslips) total about $500. Layout of the FCS setup that will be built during the immersion. CURRICULUM: Students will learn about the principles behind fluorescence and the imaging of fluorophores using fluorescence microscopy. This part of the lab will emphasize understanding the layout of a simple microscope, avoiding the tendency to treat such instruments as black-boxes. Students will learn techniques for precisely aligning optics, which will be especially critical for alignment of fluorescence emission into the fiber optic element that leads to the SPCM. They will then be exposed to the concept of photonic nanojets and the theory of FCS, and learn how to collect FCS data that is enhanced by the use of microspheres adsorbed to a coverslip surface. Data will be collected with LabView software, and Matlab software will be used to fit FCS data to a physical model. Day 1: Align a microscope with both bright field and fluorescence imaging capabilities, utilizing a CMOS camera. Demonstrate that it is working properly using fluorescently labeled microspheres. Day 2: Align the fluorescence excitation into the fiber-coupled SPCM and begin collecting FCS data using fluorescent molecules. Day 3: Optimize FCS data collection and extract physical parameters of fluorophores from these data. There are minimal safety considerations; laser safety will be discussed.